AllegroMedical.com presents The Medi-Pak Medicine Cup. 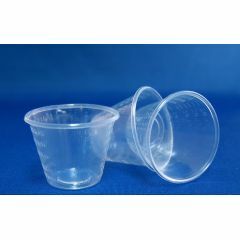 Medi-Pak Medicine Cups. With Lip. 1 oz. Clear. Graduated. Non-Sterile. Polypropylene. Single patient use. Not made with natural rubber latex. Easy to read. Great size. I use these as a cheap method to mix my epoxy for cups that I hand make. Great price so I don&acirc;&#128;&#153;t feel bad throwing them out each use. GREAT!. AMAZING PRICE!. FAST SHIPPING!. I ordered this product and received it so quickly. I use it to administer medicine for my child and also to measure and mix epoxy for multiple crafts. It is such an amazing price and works well. I am happy I found this product. You will not be sorry.